Eden Home, the destination for naturally stylish goods, today announced that it will donate five percent of all bedding sales to World Vision, an organization that helps children, families, and their communities worldwide to reach their full potential by tackling the causes of poverty and injustice. World Vision works in nearly 100 countries around the globe, combating the root causes of poverty and partnering with communities to find lasting ways of improving the lives of children and their families. World Vision also provides disaster relief to communities domestically and internationally, including aid to children and families after Cyclone Nargis in Myanmar, or the hurricanes that battered the Gulf Coast in 2008. "We are grateful that Eden Home has chosen World Vision as their charity of choice. Our corporate partners are instrumental in supporting our child-focused work around the world, and Eden Home's support will be invaluable to our mission" said Mike Veitenhans, Senior Vice President, Corporate Development, Gifts-in-Kind & U.S. Programs. "Eden Home is honored to have the opportunity to work with World Vision and play a part in its vital efforts on behalf of those who need assistance throughout the world," said Alexandra Smith, co-founder of Eden Home. "We encourage our Eden Home customers to participate with us in this program to help others." Eden Home, an online destination boutique for organic and sustainably produced items, is dedicated to improving the health of individuals and the community as a whole. The products carried by Eden Home are produced with the purest ingredients and materials under Fair Trade guidelines. Eden Home makes it easy for consumers to determine this information with its "Leaf of Approval" seal. This seal ensures that the products Eden Home carries are carefully selected to be organic or all natural in processing from start to finish. Eden Home does the investigation into product manufacturing processes and ingredients so that customers purchase with peace of mind. Both adult and baby bedding items are part of the World Vision donation program. Eden Home bedding product lines include Plover Organic, Veritas Organic Linen, Under the Canopy Organic Bedding, Raksha Bella Organic Textiles, Noo Noo and Eden Baby Exclusives by Luxe Baby. The purity of these products is represented by Eden Home's line of Plover Organic Linens, which utilize cotton from non-genetically engineered seeds grown in soil that is free of pesticides, herbicides or other cytotoxins. This keeps poisons away from the consumer and out of the ecosystem by using a hydrogen peroxide bleaching process and only low-impact, fiber-reactive dyes. Plover Organic Linens are designed in the USA and made in India using Fair Trade practices. The environmentally-friendly processing also ensures that nothing feels softer to the skin and pampers more. To learn more about Eden Home's partnership with World Vision and how you can participate, please visit http://www.EdenHome.com. World Vision is a Christian humanitarian organization dedicated to working with children, families, and their communities worldwide reach their full potential by tackling the causes of poverty and injustice. We serve all people regardless of religion, race, ethnicity, or gender. For more information, visit http://www.worldvision.org . Eden Home, the destination for naturally stylish goods, offers the most comprehensive selection of organic products for the home, women and children. Eden Home's healthy choices range from organic clothes for baby to luxurious organic bed and bath linens; and from natural cookware to organic skincare. If it's organic and stylish, you'll find it at Eden Home. Our customers can rest assured that we monitor the organic quality of our products to ensure that the entire process to create them is pure from start to finish. 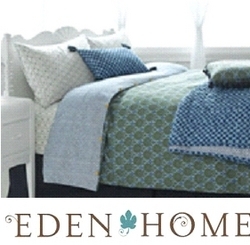 Eden Home…naturally stylish. To learn more about Eden Home, please visit http://www.EdenHome.com.